On January 1/14, the Holy Orthodox Church observes the Feast of Circumcision of Our Lord along with that of the Holy Hierarch Basil the Great, Archbishop of Caesarea in Cappadocia. 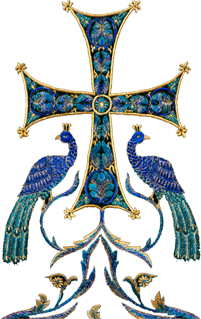 On this day Saint Basil’s parish in St Louis, MO, celebrates its patronal feast. For every parish the feast of its patron saint is a solemn and joyful event. The festivities acquire an extra dimension when presided over by the ruling hierarch. The celebration began with the All-night Vigil on Saturday night, Jan. 13, when serving together with Archbishop Peter were a number of local, as well as visiting clergy: St Basil’s rector Archpriest Martin Swanson, priests Joseph Strzelecki and Josef von Klarr (Assumption Greek Orthodox Church, Town and Country, MO), Achilles Karathanos (Sts Constantine and Helen Greek Orthodox Church, Swansea, IL), Michael Volzhansky (Holy Archangels Monastery, House Springs, MO), Sergii Alekseev (cleric of St Basil’s) and Archdeacon Sergius (Holy Cross Hermitage, Wayne, WV). At the end of the Vigil Archbishop Peter took the opportunity to thank the local priests for coming to celebrate the parish feast day, as most of them would be serving the next morning Divine Liturgy in their own parishes, since the feast of Holy Hierarch Basil the Great fell on a Sunday this year. The following morning Archbishop Peter was welcomed by young girls in traditional Russian dresses who presented Vladyka with flowers and parishioner Michael Orlando who greeted our Archpastor with the traditional bread and salt. 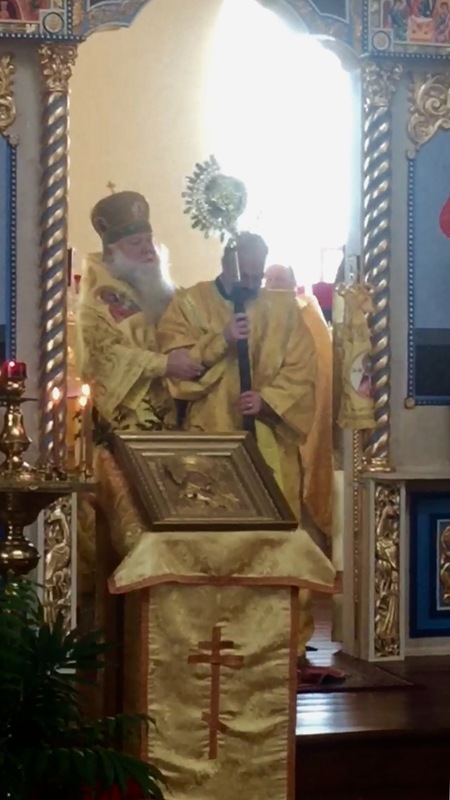 In the narthex awaiting Vladyka’s blessing were Archpriests Martin Swanson and Radomir Chkautovich (retired Serbian priest attached to St Basil’s), priests Michael Volzhansky and Sergii Alekseev and Archdeacon Sergius. During the reading of the Hours, St Basil’s parishioner Daniel Domer was tonsured a Reader and Reader Thomas Nichols was ordained a Subdeacon. Following the Great Entrance, Subdeacon Ephraim Galloway was ordained a Deacon. At the end of the Divine Liturgy, Archbishop Peter greeted the parish clergy, including the newly-ordained Deacon, Subdeacon, Reader and the faithful of St Basil’s with their second Pascha. In his homily, Vladyka spoke about the significance of the Circumcision of the Lord wherewith, following the Virgin Birth of the Saviour, the world could once again be assured that the incarnation of the Divine Logos was not an apparition, nor illusion. The Son of God truly took on human nature, remaining True God and becoming True Man. Vladyka also thanked the monks of the Holy Cross Hermitage Archdeacon Sergius and ryasaphor monk Nicholas (who served in the altar) for helping make serving the Divine Liturgy of Saint Basil the Great with a triple ordination “painless”. At the festive trapeza, Vladyka answered many questions of the parishioners and spoke about his roots, the history of his family and his own childhood. The faithful did not want to let Vladyka go, for St Basil’s parish has the joy of seeing their archpastor only once a year, but he had to rush to the airport to return to Chicago. We thank God for making it possible for our ruling hierarch to be with us, to pray with us and to teach us how to remain on the path to salvation.